We previously discussed ways to improve your holiday email campaigns to achieve greater success and improve your email marketing strategy. But, what does that look like when put to use? There are many approaches you can take when developing campaigns for the holiday season, so it’s important to explore your options and decide what approach works best within your marketing strategy. In this showcase, we’ll explore popular types of holiday email campaigns, including examples of each. We hope you’ll find some inspiration for your holiday email marketing. Putting together a holiday gift guide is a great way to showcase your products in a new way to customers. Consider putting together special categories or landing pages that are specific to the holidays. 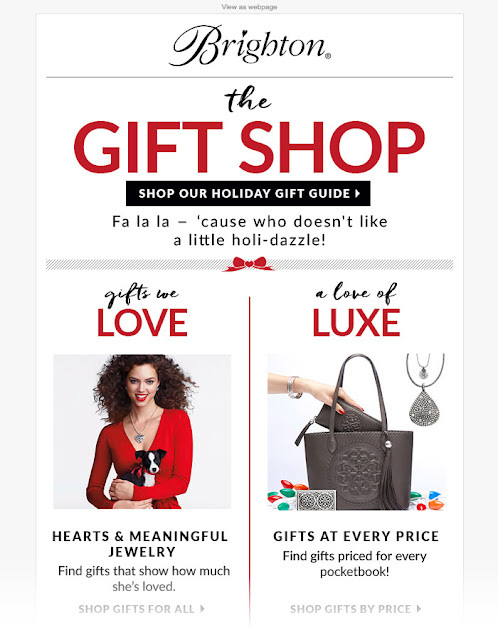 Brighton’s email campaign advertises gift guides for a variety of product collections. This is likely the most popular type of emails we get over the holidays. Naturally, if your business is offering any sales or deals over the holidays, make sure to get that information out to your subscribers. Better yet, try offering special coupons or sales offers exclusive to email subscribers to help generate new leads. 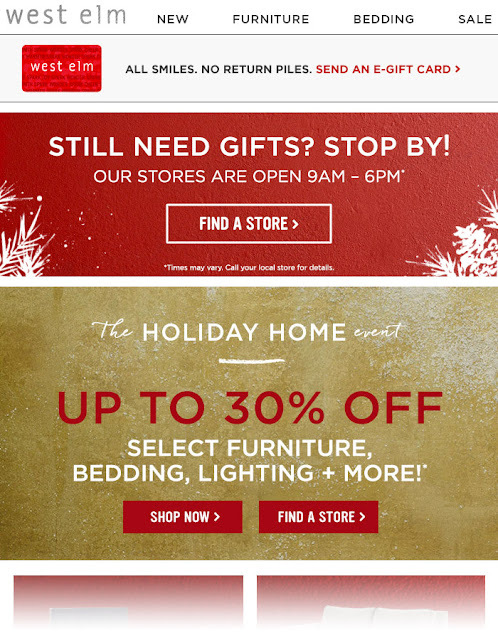 West Elm’s email campaign advertises one of its holiday sales. Combine both content and email marketing efforts by promoting any holiday-specific content you’ve created. Consider promoting relevant blog posts, content offers, or other marketing materials in your holiday email campaigns. 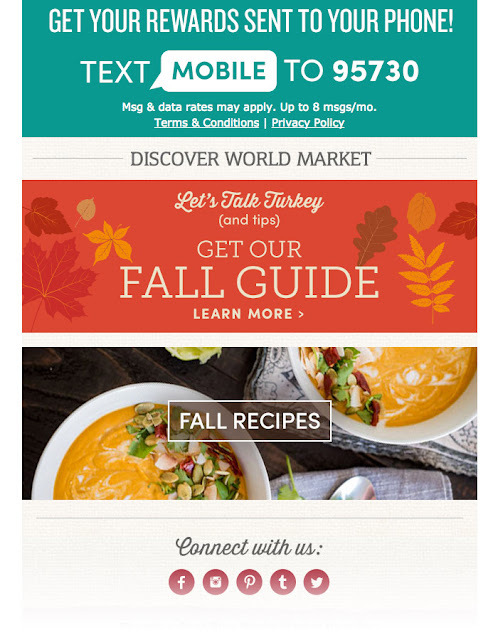 In this World Market email campaign, they promote a special collection of blog posts and other Thanksgiving-related content. If you have any special holiday events coming up, an email campaign is a great way to get the word out. Don’t forget to encourage your subscribers to share with friends to spread the word. 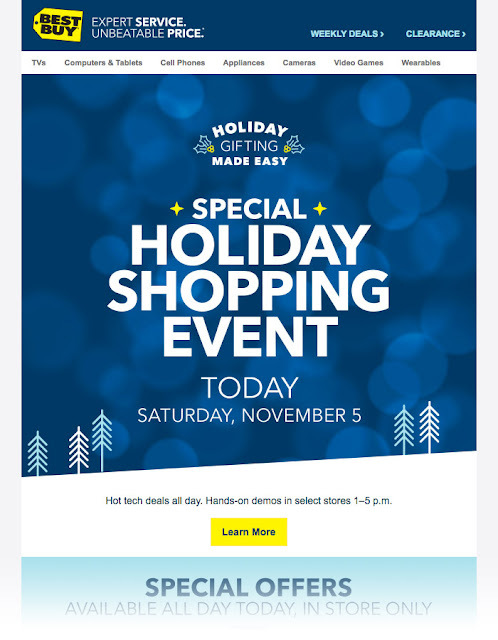 Best Buy’s email campaign shares information about a special holiday shopping event. Not every email campaign needs to be focused on selling or promoting something. 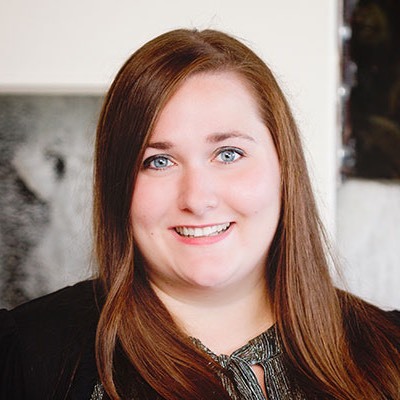 It’s also important to connect with your subscribers on a personal level and help keep your business on their minds. Sending out a holiday card is a great way to do that, and to show them that you appreciate their interest in your company. 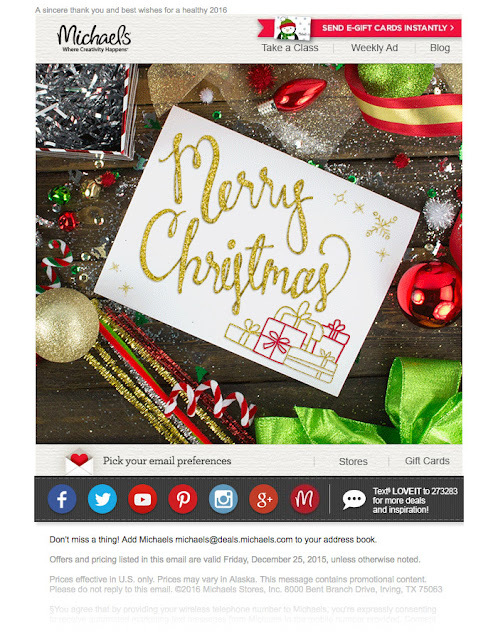 Michaels sent out an email campaign wishing subscribers a merry Christmas.